Hello Friends! 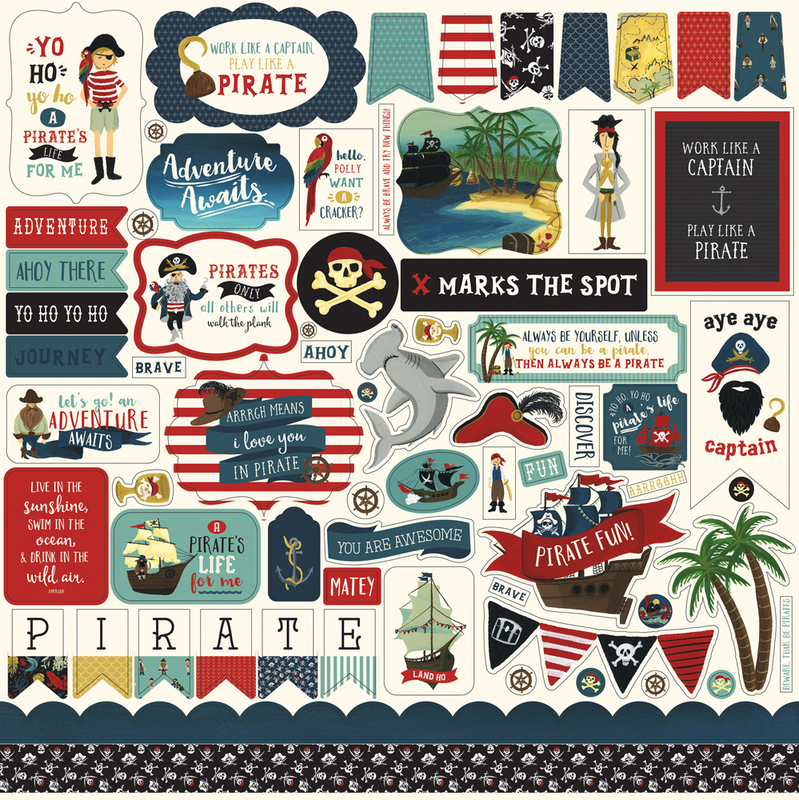 Dorymar with you today, and I am so excited to share with you a new layout with the new Pirate Tales Collection. This collection is filled with many fun pirate things! Arrrggghhhh! When you think about pirates, you associate it quickly with males, but in this case, I used a beautiful picture of my little girl in her pirate costume. Isn’t this cute? For the base I used the Ahoy Matey Patterned Paper and a piece of the back of the 3x4 Journaling Cards Patterned Paper reduce at 11.5" x 11.5". For this page, I wanted to play with colors in the collection, so I used a Ship Wheel cut file from Echo Park Paper Silhouette Store to create a fun background. The wheel was cut from the back of the Shark Bait Patterned Paper, backed with Sea Monster Patterned Paper, also I used a transparent paper and sequins to create a big shaker! To give the rustic touch I added some jute ribbon, twine and black enamel dots! The result was FANTASTIC! To add more fun, I used the Sail Away 6x6 Stencil with a brown art crayon to add a bit of color to the background. I fussy cut a pirate and a ship from Journaling Cards Patterned Papers and added them along each side of the photo. I added stickers, die cuts as well are chipboard pieces to decorate my page and of course I used some dimensional adhesive on most of my embellishments. I love layers! I used the Pirate Sticker Banner with a combination of die cut pieces to create the title. For some extra depth and dimension, I used some dimensional adhesive underneath. With a black pen I emphasize the Pirate Word and just look perfect! I love how this project turned out! 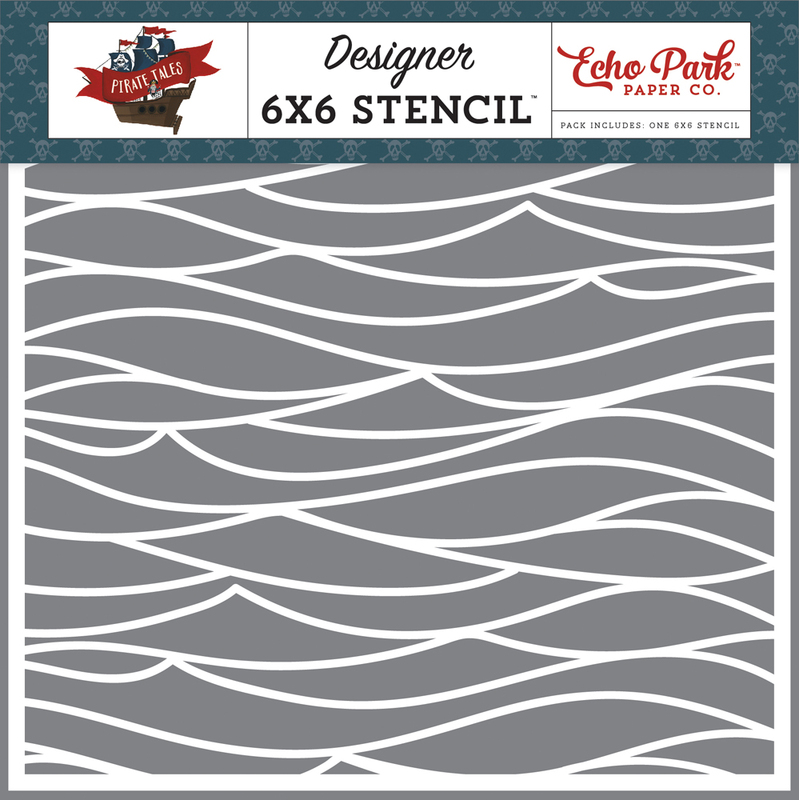 I hope this project inspires you to create with the wonderful Pirates Tales Collection from Echo Park. Download the FREE instruction sheet with step-by-step instructions and a complete supply list HERE! Absolutely stunning! Love how detailed and crafty is this layout! Thanks for sharing!